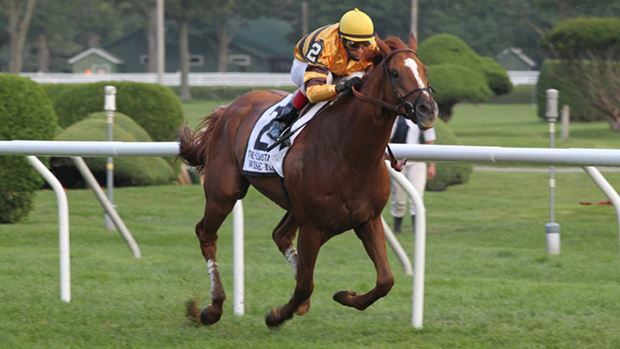 Wise Dan, a major stakes winner in the United States and Canada last year, was named the 2012 Horse of the Year Saturday evening at the 42nd Annual Eclipse Awards, presented by Daily Racing Form, The Stronach Group and Breeders’ Cup. The Eclipse Awards, held at Gulfstream Park in Hallandale Beach, Fla., honor excellence in Thoroughbred racing and are voted on by representatives of the National Thoroughbred Racing Association, Daily Racing Form (DRF) and National Turf Writers And Broadcasters (NTWAB). Owned and bred by Morton Fink of Northbrook, Ill., Wise Dan finished first in the balloting with 194 votes, followed by Reddam Racing’s I’ll Have Another, winner of the 2012 Kentucky Derby and Preakness Stakes, with 30 votes, and Mrs. Janis Whitham’s Fort Larned, winner of last year’s Breeders’ Cup Classic, with 12 votes. Fourth was Besilu Stables’ Royal Delta, winner of the Breeders’ Cup Ladies’ Classic, with eight votes. (Complete Horse of the Year results are listed below). Wise Dan also won the Older Male and Male Turf Eclipse Awards this evening, and becomes the first horse since John Henry in 1981 to win those two awards and Horse of the Year in the same year. As a 5-year-old in 2012, Wise Dan—trained by Charles Lopresti—won five races from six starts and competed on synthetic, dirt and turf surfaces. He began the year with a track record setting 10 ½-length victory in the Grade III Ben Ali Stakes at Keeneland on Polytrack in April. After losing the Grade I Stephen Foster Handicap on dirt at Churchill Downs in June by just a head, Wise Dan won four consecutive races on turf: the Grade II Fourstardave at Saratoga; the Grade I Woodbine Mile at Woodbine in suburban Toronto; the Grade I Shadwell Turf Mile at Keeneland, and the Grade I Breeders’ Cup Mile at Santa Anita Park in November. In the Breeders’ Cup Mile, Wise Dan broke a course record that had stood since 1989. He finished 2012 with $2,622,037 in total earnings. John Velazquez rode Wise Dan in all of his races during 2012 except for the Shadwell Turf Mile. On that occasion, he was ridden by Jose Lezcano. Wise Dan is a chestnut Kentucky bred gelded son of Wiseman’s Ferry out of Lisa Danielle by Wolf Power. He is expected to begin his 2013 campaign this spring. The 2012 Eclipse Award winners and results for each category appear below. 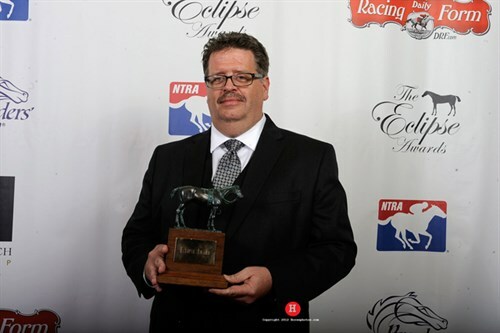 Digital images from the Eclipse Awards ceremony will be disseminated by Horsephotos on January 19. In voting that concluded January 3, 2013, Eclipse Awards voters cast their ballots to rank the top three horses and individuals in each Championship division on a 10-5-1 point system basis. This voting established the top three finalists in each division, whose names were released on Jan. 5, 2012. Shanghai Bobby, 253; Uncaptured, 1. Beholder, 225; Executiveprivilege, 27; Dreaming of Julia, 1; So Many Ways, 1. I’ll Have Another, 247; Bodemeister, 3; The Lumber Guy, 1; Paynter, 1; Union Rags, 1; Voter Abstention, 1. Questing (GB), 106; My Miss Aurelia, 102; Believe You Can, 17; Contested, 13; Dance Card, 6; Lady of Shamrock, 5; In Lingerie, 4; Zo Impressive, 1. Royal Delta, 231; Groupie Doll, 22; It’s Tricky, 1. Trinniberg, 233; Shackleford, 11; The Lumber Guy, 8; Caixa Electronica, 1; Voter Abstention, 1. Groupie Doll, 250; Mizdirection, 3; Contested, 1. Wise Dan, 170; Little Mike, 78; Point of Entry, 5; No Vote, 1. Zagora (FR) 242; Marketing Mix, 5; Lady of Shamrock, 4; Dayatthespa, 2; Voter Abstention, 1. Pierrot Lunaire, 116; Demonstrative, 99; Arcadius, 1; Divine Fortune, 1; Woodmont, 1; Voter Abstentions, 36. Wise Dan, 194; I’ll Have Another, 30; Fort Larned, 12; Royal Delta, 8; Little Mike, 6; Frankel, 1; Groupie Doll, 1; Shanghai Bobby, 1; Voter Abstentions, 1. Godolphin Racing, LLC, 138; Midwest Thoroughbreds, 50; Reddam Racing, LLC, 26; John C. Oxley, 13; Morton Fink, 12; Kenneth and Sarah Ramsey, 2; Janis Whitham, 2; Zayat Stables, 2; Repole Racing, 1; Starlight Racing, 1; Voter Abstentions, 1. Darley, 170; Adena Springs, 25; Morton Fink, 20; Brereton C. Jones, 15; Janis Whitham, 4; Phipps Stable, 3; Harvey Clarke, 2; Fred and William Bradley, 1; William D. Graham, 1; Palides Investments, 1; Kenneth and Sarah Ramsey, 1; Stonestreet Thoroughbreds, 1; Voter Abstentions, 10. Dale Romans, 119; Todd Pletcher, 87; Bob Baffert, 35; Chad Brown, 2; Bill Mott, 2; Jamie Ness, 2; Doug O’Neill, 2; Steve Asmussen 1; Ian Wilkes, 1; Voter Abstentions, 3. 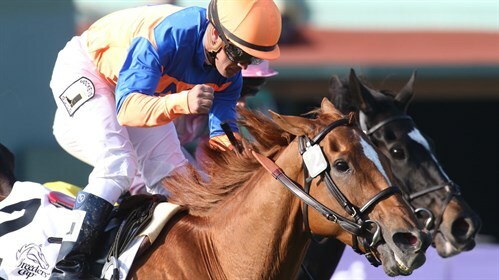 Ramon Dominguez, 201; John Velazquez, 37; Rosie Napravnik, 4; Russell Baze, 2; Rafael Bejarano, 2; Javier Castellano, 2;Mario Gutierrez, 1; Mike Smith, 1; Voter Abstentions, 3; No Vote, 1. Jose Montano, 127; Irad Ortiz, Jr., 34; Angel Suarez, 25; Eswan Flores, 16; Wilmer Garcia, 4; Eliska Kubinova, 4; C.J. McMahon, 2; Jose Ortiz, 2; Hugo Sanchez, 2; Nicolas Milford, 1; Voter Abstentions, 37. The winner of the Award of Merit, voted on by a panel of representatives from the three presenting organizations and previously announced, is Nick Nicholson. The Award of Merit is presented to honor outstanding lifetime achievement in the Thoroughbred industry. 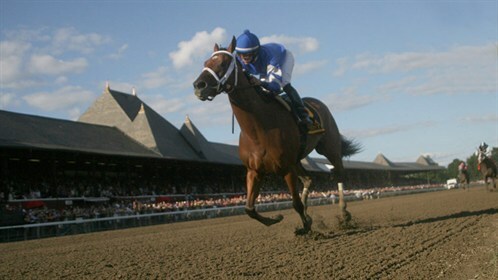 Photography – Tom Keyser, Daily Racing Form; “Start of Brooklyn Handicap, July 11, 2012. Writing – Feature/Commentary: Ryan Goldberg, Daily Racing “Keiber Coa Presses on a Year After Father’s Fateful Spill,” July 7, 2012. Writing – News/Enterprise – Mary Simon, Thoroughbred Times, “Added Obstacle” June 9, 2012. Television – Live Racing: NBC Sports, “The Kentucky Derby”; Rob Hyland, Coordinating Producer; May 5, 2012. Television – Feature: ESPN, “Notinrwilderstdremz”, Heather Lombardo, Producer; October 30, 2012. Audio and Multi-Media Internet – Glenye Cain Oakford, Daily Racing Form.com “Zenyatta: Wait for First Foal Combines Science, Art and Anticipation,” February 28, 2012.